At least 3158 people were detained, with 1127 of them put in pre-trial detention in operations targeting Turkey’s Kurdish minority, and the Gülen group, which the Turkish government accuses of masterminding a coup attempt on July 15, 2016, throughout July, according to data released by the Turkish Interior Ministry on Monday. The detentions and arrests took place between October 1 and October 31. On Oct. 30, the Interior Ministry said in a written statement that a total of 759 people were rounded up in operations targeting the Gülen group between Oct 23 to 30. On Oct. 30, Republican People’s Party (CHP) İstanbul deputy and former journalist Barış Yarkadaş said that in October, 12 journalists in Turkey were detained, four of them were put in pre-trial detention and eleven others were given prison sentences. On Oct. 30, the Human Rights Association (İHD), a prominent pro-Kurdish NGO, stated that in Turkey there are 1,025 prisoners in poor health, 357 of whom are seriously ill, subjected to deplorable conditions. On Oct. 30, three people were detained in Turkey’s border province of Edirne while they were on their way to escape to the Greece, Dogan news agency reported. Dogan said one of the detainees had been under investigation over over his links to the Gulen movement while the remaining two were suspected to be ByLock users. ByLock is a controversial, encrypted mobile app that Turkish government believes to be the once top communication tool among Gulenists. On Oct. 30, Nazife Onay, one of the thousands of teachers who were removed from their jobs by decrees issued by the Turkish government in the aftermath of a failed coup attempt on July 15, 2016, was arrested after spending 12 days under police custody. On Oct. 30, Murat Baran, the owner of the Kırsehir-based Baran pharmacy store and the president of the Kırşehir Ahi Businessmen Association (KAHİAD) until it was shut down by the government, was sentenced to 42 years and 6 months in prison. The court also handed over TL130,000 [$35,000] fine to him. On Oct. 30, Ahmet Edip Uğur, the mayor of Balıkesir resigned in tears under mounting pressure exerted by President Recep Tayyip Erdoğan, saying that the pressure and threats were now extending to his family. Emel Diril, Bahattin Özdemir, Nergis Tuba Aslan, Dinçer Çalım, Şule Arslan, Yemen Cankan. On Oct. 28, Fevzi Kayacan, a lawyer and the former president of the Konya Bar Association, was sentenced to 10 years 6 months in jail over his ties to the Gülen group. On Oct. 28, a Sakarya court accepted an indictment against the sister-in-law and the father-in-law of Turkey’s major coup suspect Adil Öksüz, state-run Anadolu news agecy reported. The indictment drafted by the Sakarya Chief Public Prosecutor’s Office and seeks a life sentences and additional jail sentence of up to 15 years for the Öksüz’s sister-in-law Emine Sennur Sen, and father-in-law Cevat Yıldırım. Öksüz is accused of being the head of the Gülen group’s alleged network within the air force. He was briefly detained after the coup attempt and is still at large. On Oct. 27, properties belonging to 12 media outlets that the Turkish government seized under post-coup emergency rule, were put up for sale by the state-run Savings Deposit Insurance Fund (TMSF). TMSF listed properties belonging to Adana Medya Newspaper, Art Tv ve Art Radio, Haber Radio Ege, Herkül Fm, Htv Hayat TV, Kanal 24 TV, Nazar newspaper, Özgür Gündem newspaper, Özgür Radio, Taraf Daily, Uşak Radio Klas and Yeni Emek Newspaper to be sold at auction. On Oct. 27, at least 30 people were detained near Turkey’s maritime border with Greece with most of them escaping from the government’s post-coup crackdown, state-run Anadolu news agency reported. Police made Ö.C.K. wear the Hero T-shirt inside out. On Oct. 26, a 30-year-old hotel receptionist in Turkey’s resort district of Bodrum, identified only by his initials Ö.C.K, was detained for wearing a “hero” T-shirt. Police rounded up Ö.C.K and cuffed his behind back before escorting him to the Bodrum police station. Police also made him wear the T-shirt inside out, media said. Any material bearing the word “hero” has become suspicious following a series of detentions across Turkey. The hero T-shirts first became an issue when Gökhan Güçlü, one of the suspects on trial for an assassination attempt against President Recep Tayyip Erdoğan on the night of a coup attempt last year, was thrown out of the courtroom on July 13 for wearing a similar T-shirt. At least 42 people have been detained for wearing hero T-shirts since summer. On Oct. 26, Turkey’s Education Ministry closed down four private schools as part of an administrative investigation into what it calls Fethullahist Terrorist Organization (FETO). According to state-run Anadolu news agency, Bahar Primary School and Bahar Secondary School in the capital Ankara, Morbir Pre-school in Hatay and Bornova Umut High School in Izmir were shuttered over their alleged ties to the Gulen movement. On Oct. 26, at least 48 people were detained over their alleged use of ByLock mobile application during dawn raids in Istanbul. On Oct. 26, warrants were issued to detain 121 former public workers who were earlier removed from their jobs at the Foreign Ministry over alleged ties to the Gülen group. Police in 30 provinces carried out operations as part of an Ankara-based operation to detain 121 former diplomats. Media said all of the suspects were earlier dismissed with post-coup emergency decrees. On Oct. 26, a court in Izmir ruled for the continuation of the pre-trial detention of Taner Kılıç, chair of the board of Amnesty International’s Turkey section. 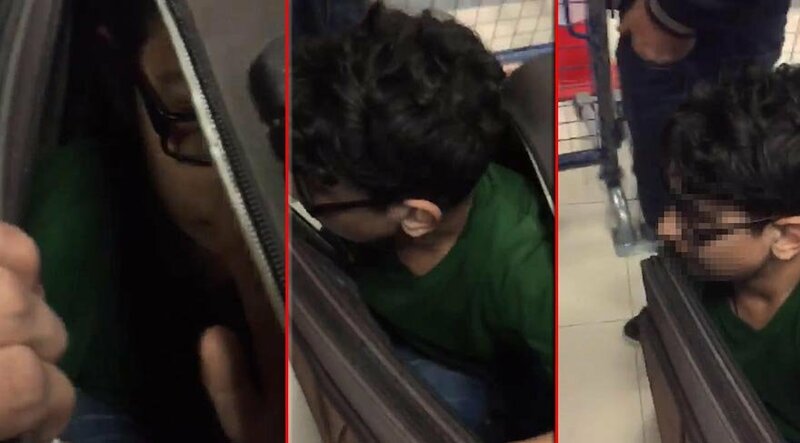 On Oct. 25, a 14-year-old Turkish boy, identified by his initials S.K., was detained in a suitcase in Turkey’s Artvin province while he was on his way to escape to Georgia. Police stopped a Georgian national and made him open his suitcase upon suspicion at Turkey’s Sarp border gate with Georgia. Hidden in the suitcase was S.K. who was poised to reunite with his parents in Georgia. According to Turkish media, S.K.’s parents earlier escaped Turkey where they are being sought for their alleged links to the Gülen group, which the government accuses of masterminding the July 15, 2016 coup attempt. 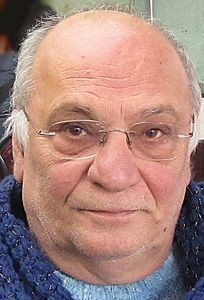 Barış Pehlivan, editor-in-chief of the Oda TV news portal. On Oct. 25, Barış Pehlivan, editor-in-chief of the Oda TV news portal, was given 11 months 20 days prison sentence for “insulting” Turkish President Recep Tayyip Erdoğan. According to the Diken news portal, Pehlivan found guilty for publishing the sarcastic comments made by the British comedian John William Oliver’s comments during the HBO political talk-show. On Oct. 24, a dormitory manager in Turkey’s Black Sea province of Samsun, identified by his initials F.T., was sentenced to 9 years and 9 months in prison, state-run Anadolu news agency reported. F.T., the last manager of a Samsun dormitory, established by the followers of the Gulen movement and shut down by the government in the aftermath of the July 15, 2016 coup attempt, appeared before the court in charge for his final hearing. On Oct. 23, the Interior Ministry said in a written statement that 643 people were rounded up in operations targeting the Gülen movement in between Oct 16 and 23. On Oct. 23, a total of 10 people were detained near Turkey’s maritime border with Greece with most of them escaping from the government’s post-coup crackdown, Dogan news agency reported. Coast guard in Mugla stopped a speedboat off the shores of the resort town of Turgutreis, and rounded up 10 Turkish nationals along with 2 Ukrainian citizens, who are believed to have facilitated the illegal departure attempt as smugglers. The suspects had reportedly gathered to sail through the Greek island of Kos. Dogan said detainees include four children and two women and that half of them were accused of having links to the Gulen movement in earlier investigations. On Oct. 22, five people were detained in Turkey’s Kayseri province on the grounds that they have made propaganda on behalf of the Gulen group on social media. On Oct. 22, former judges Bülent Kınay and Fatih Mehmet Uslu were detained by Turkish security forces while trying to flee to Greece from Turkey’s Edirne province. According to the state-run Anadolu news agency, Kınay and Uslu were detained by Edirne gendarmes while trying to illegally cross Turkish-Greek border along with several other illegal immigrants. Anadolu said the two former judges, who were earlier removed from their jobs in the government’s post-coup crackdown, were detained over their links to the Gülen group, which is accused by the Turkish government of being behind a failed coup last year. On Oct. 22, at least 7 people were detained for having raised the amount of the money held at their Bank Asya accounts after late 2013, state-run Anadolu news agency reported. 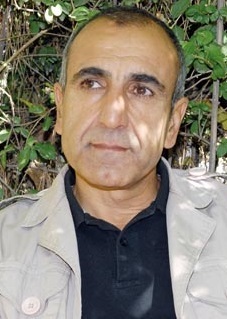 On Oct. 21, the Gaziantep Regional Court of Justice approved a 55 month, 10 day prison sentence for Ferhat Encü, one of 10 jailed deputies from the pro-Kurdish Peoples’ Democratic Party (HDP). The Şırnak 2nd High Criminal Court on June 9 had handed down a prison sentence of 55 months, 10 days on terror charges. 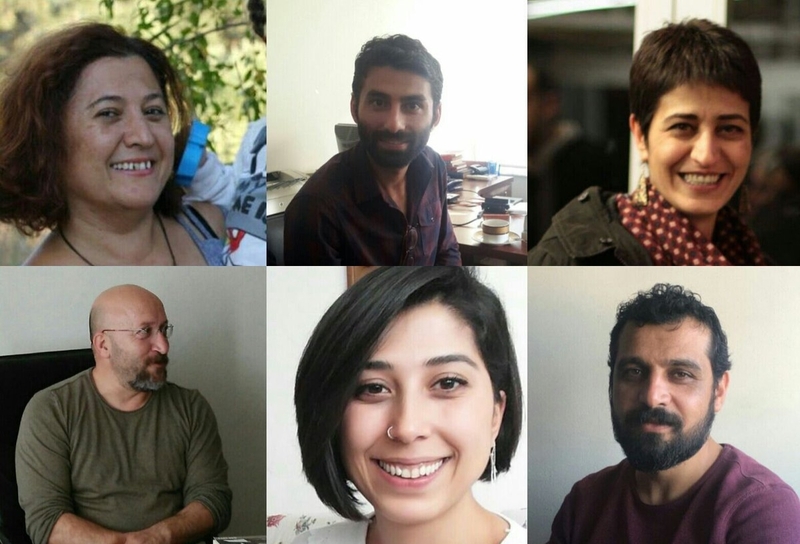 On Oct. 20, Ankara police detained 5 journalists following house raids. Mezopotamya news agency reporters Selman Güzelyüz and Diren Yurtsever, and Jinnews editor Sibel Yükler were rounded up along with Duygu Erol and Habibe Eren, reporters for the latter media outlet. Media reported that the detentions were made “upon a complaint,” while Mezopotamya said “It is worthwhile to note that those detained were the ones who reported on protests in support of Turkey’s hunger striking educators Nuriye Gulmen and Semih Ozakca.” The prosecutor in charge imposed a confidentiality order on the case as public is unavailable to find out the details. On Oct. 20, detention warrants were issued for 102 former owners, executives and employees of Kaynak Holding, which was seized by the government in November 2015 due to its links to the Gülen group, according to state-run Anadolu news agency. 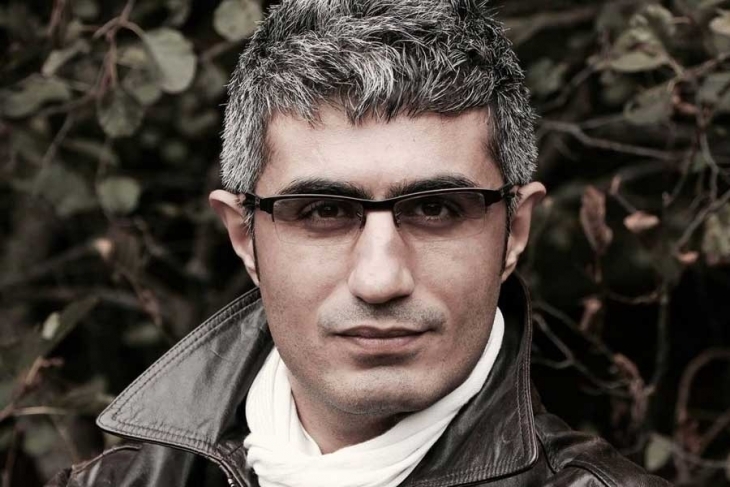 On Oct. 20, journalist Tuğrul Eryılmaz was given a suspended jail sentence of 15 months and TL 6,000 in fine over his participation in a solidarity campaign with the pro-Kurdish Ozgur Gundem newspaper. On Oct. 20, Kurdish Writer and journalist Vedat Çetin was detained in Diyarbakır as part of an investigation into the pro-Kurdish Democratic Peoples’ Congress (DTK). On Oct. 20, Center for Middle Eastern Strategic Studies (ORSAM) Director Şaban Kardaş was detained at his home in Ankara as part of an investigation in which prominent human rights activist and businessman Osman Kavala was detained several days earlier. On Oct. 20, at least seven people were detained while they were on their way to escape Turkey to Greece, Dogan news agency reported. On Oct. 19, Halil Aykul, a mechanical engineering professor and the former dean of the engineering faculty at Turkey’s Hitit University, was sentenced to 6 years, 10 months and 15 days in jail over terror charges. 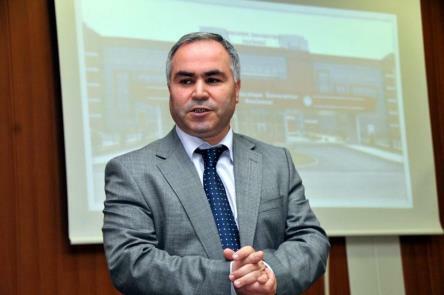 On Oct. 19, Mehmet Ünlü, a medical professor and the chief physician at the Kocatepe University hospital in Afyonkarahisar until he was dismissed over his alleged links to the Gulen group, was sentenced to 12 years in prison. 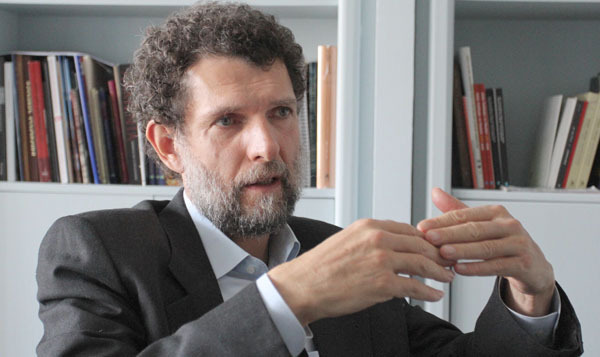 On Oct. 18, Osman Kavala, one of Turkey’s most prominent businessmen and the chairman of İstanbul-based Anadolu Kültür Association, was taken into custody by Turkish police upon his arrival to İstanbul’s Atatürk airport. According to T24 news portal, Kavala was detained upon his return from a visit to Gaziantep. The businessman was reportedy detained as part of a “confidential” investigation. Several media outlets close and sources close to the Ministry of Interior stated the he will be questioned about some meetings held before a failed coup attempt in Turkey on July 15, 2016. Kavala was born in 1957 in Paris and studied economics at the University of Manchester. Upon his father’s passing in 1982, he took over the management of the Kavala Companies. He was active in the establishment of a number of business organizations in Turkey, including Turkish-Polish and Turkish-Greek business councils and the Association of Tourism Investors. On Oct. 18, a prospective judge, known by his initials M.G., was put in pretrial detention after he was arrested while on way to escape to Greece. On Oct. 18, an Istanbul prosecutor launched investigation against journalist Ismail Küçükkaya and lawyer Fidel Okan for implying that the family issues minister Fatma Betül Sayan Kaya’s husband used the controversial mobile app, ByLock. Küçükkaya and Okan tweeted that Kaya divorced her spouse after she found out that he had downloaded the ByLock app. On Oct. 17, the Turkish Parliament extended for three more months a state of emergency declared in the aftermath of a failed coup attempt in Turkey on July 15, 2016, the fifth such extension since it was originally put in force. On Oct. 17, the Istanbul Public Prosecutor’s Office issued detention warrants for at least 77 people on accusations that they use a smart phone application known as ByLock, the state-run Anadolu news agency reported. On Oct. 17, the Diyarbakır Chief Public Prosecutor’s Office issued detention warrants for 58 people on accusations that they linked with the Kimse Yok Mu aid organization affiliated with Turkey’s Gülen group, state-run Anadolu news agency reported. 70-year old imam Yusuf Süne. On Oct. 16, thirty-five people in Izmir province were detained as part of an investigation into the Gulen group. On Oct. 16, the Interior Ministry said in a written statement that 809 people were rounded up in operations targeting the Gülen group in between Oct. 9 to 16. M.A. 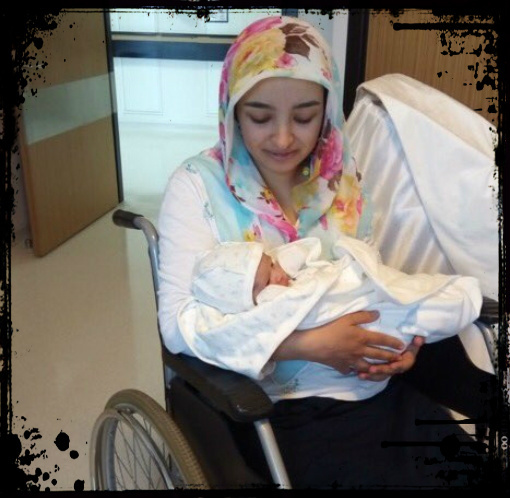 was detained hours after she gave birth at Balıkesir Sevgi Hospital. On Oct. 14, an opposition deputy tweeted that Turkish police detained a Turkish woman identified as M.A. hours after she gave birth at Balıkesir Sevgi Hospital. Sezgin Tanrıkulu, a deputy from the main opposition Republican People’s Party (CHP) has called on Turkish authorities to stop the practice of detaining women hours after giving birth due to their alleged links to the Gülen group. Tanrıkulu posted several photos of M.A. and the new-born baby, and said: “M.A gave birth at Balıkesir Sevgi Hospital this morning. [Police] awaits just outside to detain her. 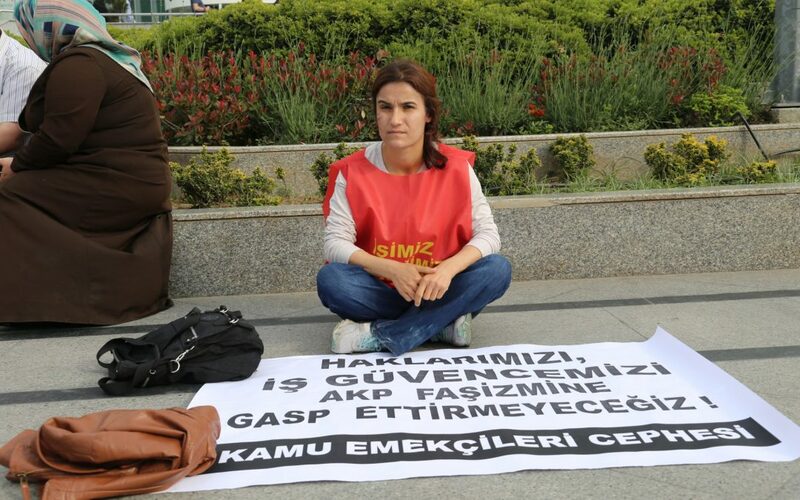 Stop this practice.” The woman was detained over alleged links to Turkey’s Gülen group. On Oct. 14, Yılmaz Çolak, president of Turkey’s police academy stated that more than 22,000 police officers have been dismissed from profession since a coup attempt on July 15, 2016. On Oct. 14, ex-director of a Turkish schools in Pakistan, Mesut Kaçmaz, and his family were deported to Turkey days after they were abducted from their apartment in Lahore, according to the friends of the family. The couple was blindfolded and forcefully put on an unmarked flight from Islamabad to İstanbul in the morning of October 14. Upon arrival to İstanbul, Kaçmaz and his wife were taken by police to Ankara for interrogation while their children were left alone in İstanbul. They are believed to be abducted and returned to Turkey over their link to Turkey’s Gülen group. On Oct. 14, an Ankara prosecutor issued detention warrants for a total of 100 former police officers over alleged use of a smart phone application known as ByLock. On Oct. 12, Turkish government banned the sale of three books written about Kurds and Kurdish issue on the grounds that they display “the character of a terrorist organization,” Gazete Duvar online news portal reported. On Oct. 12, twenty-five more companies in Turkey’s western province of Aydin were seized by the government as part of an investigation into the Gülen group. 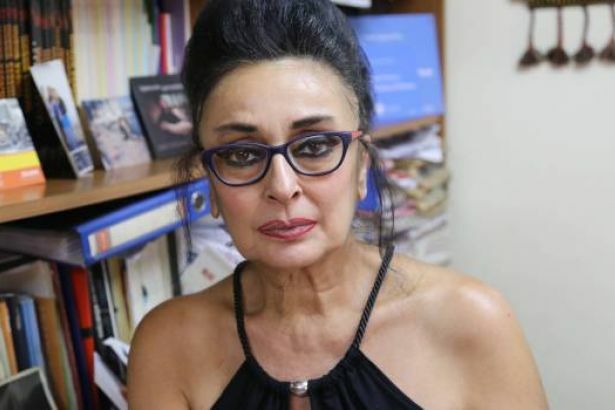 On Oct. 12, Eren Keskin, a human rights activist, a lawyer and a columnist, was sentenced to 6 months in jail on conviction of insulting the security forces. The jail sentence was converted to TL3,000 fine. She was charged for insulting the state security forces in one of her articles at the pro-Kurdish Özgür Gündem newspaper. On Oct. 12, fourteen people in Adana and Kayseri province were detained as part of an investigation into the Gulen group, which the government accuses of leading the July 15, 2016 coup attempt. On Oct. 10, an Antalya court ruled for the arrest of former Bursa governor Hasan Kürklü on charges of alleged links to the Gülen group. On Oct. 10, Mehmet Güzel, a lawyer and the former president of the Erzurum Bar Association, was sentenced to 13 years in jail over his ties to the Gülen group. On Oct. 10, detention warrants were issued for at least 70 more soldiers of various ranks as part of an investigation into Turkey’s Gülen group, DHA news agency reported. On Oct. 9, fifteen people in Kahramanmaras province were detained as part of an investigation into the Gulen group. State-run Anadolu news agency reported that 15 suspects including doctors, students and teachers were rounded up over their alleged use of the ByLock application, which Turkish authorities believe is a communication tool among Gülenists. On Oct. 9, the Interior Ministry said in a written statement that at least 809 people were detained as part of an investigation into the Gülen group between Oct. 2 to 9. 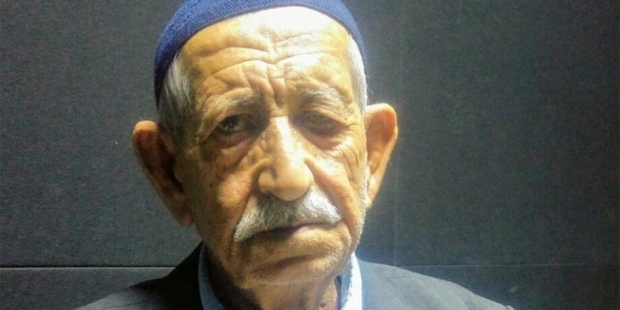 On Oct. 9, an Ankara prosecutor launched a probe against 7 people including Kezban Şaçılık, the septuagenarian mother of the dismissed civil servant Veli Şaçılık, a former political prisoner and public servant who was sacked by government decree in the aftermath of a July 15 coup attempt in Turkey. He has been staging protests against his dismissal and his colleagues’. On Oct. 7, A.Ş., 13, was handed down a 21-month suspended sentence for allegedly insulting President Recep Tayyip Erdoğan on social media, the Evrensel daily reported. According to the report, the İstanbul 2nd Juvenile Court first ruled for a three year, six month sentence but reduced it to one year, nine months because A.Ş. is under 15 years of age. The court suspended the sentence on condition that A.Ş. not commit the same crime over the next year. 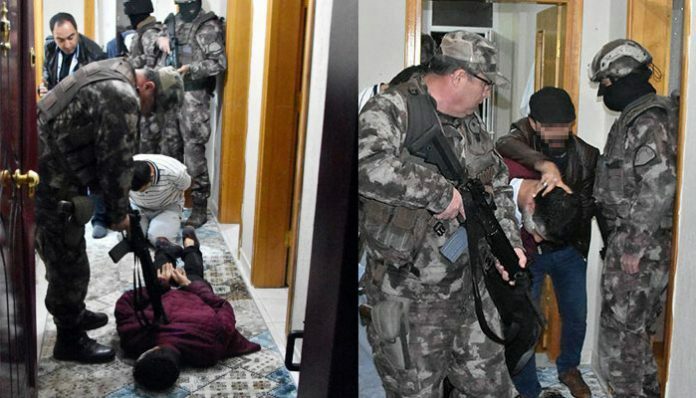 On Oct. 7, police teams armed with machine guns raided tens of student houses and detained at least 69 more people as part of an investigation into Turkey’s Gülen group, the state-run Anadolu news agency (AA) reported. According to the report, 50 people, including university students, were rounded up in the central Turkish province of Konya as part of an ongoing investigation into real and perceived supporters of the Gülen group. In a similar vein, as a result of an investigation launched in the Western province of Bursa another 19 people were detained. The police have been searching for 13 others who are reportedly at large. On Oct. 6, a court in Aydın province appointed trustees to the management of 48 companies, including leading freezer company Uğur, over alleged links to the Gülen group. On Oct. 6, detention warrants were issued for a total of 51 people due to alleged links to Turkey’s Gülen group. Turkey’s state-run Anadolu news agency reported that the İzmir Chief Public Prosecutor’s Office issued the warrants. On Oct. 6, Turkey’s top judicial body, the Board of Judges and Prosecutors (HSK) dismissed 39 more judges and public prosecutors over alleged links to the Gülen group. The state-run Anadolu news agency reported that the HSK has sent the names of the dismissed officials for publication in the Official Gazette. The number of prosecutors and judges fired over Gülen links now totals 4,560 with the latest dismissals. On Oct. 5, A.M.O., a research assistant at Karadeniz Technical University’s medical faculty until he was dismissed with a post-coup emergency decree, was sentenced to 7 years and 6 months in jail as part of an investigation into the Gulen group. On Oct. 4, Turkish prosecutors issued detention warrants for a total of 47 businessmen in Mersin province as part of an investigation into the Gülen group by the Mersin Chief Public Prosecutor’s Office, CNN Türk reported. 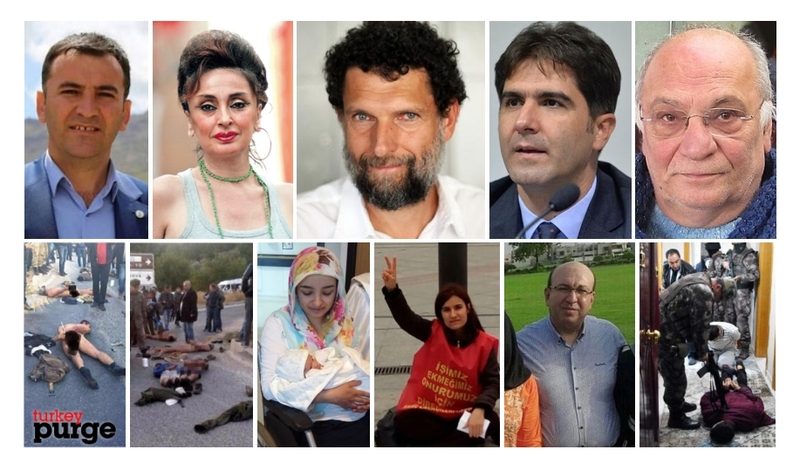 On Oct. 4, a Kirsehir court handed down 10-year prison term each to seven people who used to work as managers at the student dormitories, closed over their links to the Gulen group. On Oct. 4, a staff member in US consulate in Istanbul, known as M.T., was arrested on charges of military and political espionage against Turkish government. HDP Siirt deputy Besime Konca. On Oct. 3, The Grand National Assembly of Turkey (TBMM) stripped pro-Kurdish Peoples’ Democratic Party’s (HDP) Siirt deputy Besime Konca of her parliamentary status. On Oct. 3, İstanbul and Ankara prosecutors issued detention warrants for at least 254 people on accusations that they use a smart phone application known as ByLock, the state-run Anadolu news agency reported. 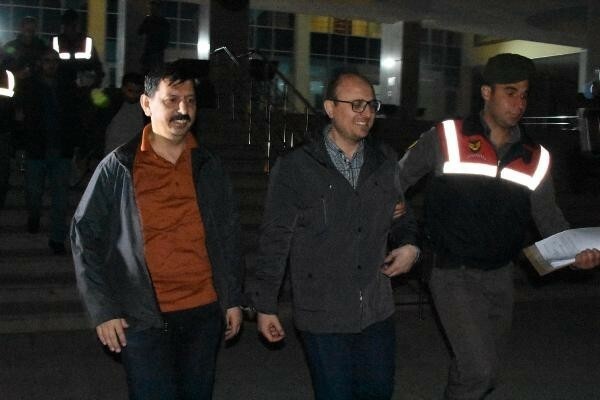 On Oct. 3, at least seven people including the ruling Justice and Development Party (AKP) Aksaray municipal council member, Hümeyra Gür, were detained over alleged links to the Gülen group. According to the Turkish media, Gül and other detainees are accused of using a mobile phone app called ByLock. On Oct. 2, a regional Turkish court approved a 15-months prison sentence for Turkish teacher Ayşe Çelik, who called for an end to clashes between Kurdish militants and Turkish security forces in Diyarbakır during a TV program in 2016, Cumhuriyet reported. According to the report Çelik, who said “Don’t let children die” during the “Beyaz Show” TV program, will give birth in prison as she is currently three months pregnant. On the night of Jan 8, 2016, a woman who introduced herself as Ayşe Çelik appear on the live “Beyaz Show,” hosted by renowned Turkish comedian Beyazıt Öztürk, and talked about the clashes that had been raging for months between Kurdish militants and Turkish security forces in Diyarbakır, the largest city of the mainly Kurdish Southeast. On Oct. 2, seven people were stripped naked with their hands tied on their back before they were detained as part of an investigation into the outlawed Kurdistan Workers’ Party (PKK), in Turkey’s resort province of Mugla. On Oct. 2, detention warrants were issued against 47 businessmen in the southern province of western as part of an investigation into the Gülen group.